Even Dave James’ fat hands are nimble enough to build a mini-pc, so why not let a little machine into your living room. For all Valve’s posturing about bringing the PC into the living room, the small form factor PC isn’t a new thing. 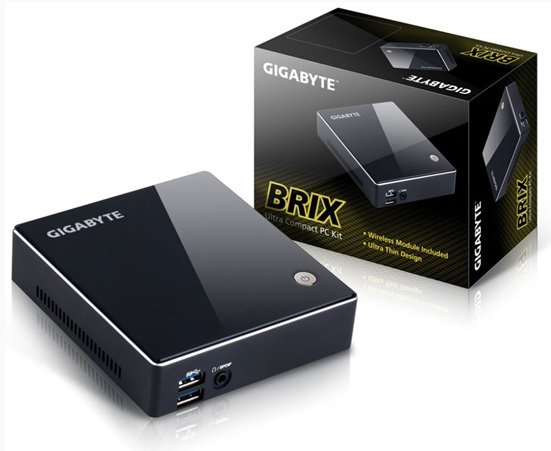 But whether we’re talking about Intel’s NUC, Gigabyte’s BRIX or the various ickle boxes from Zotac or Sapphire, they’ve always had one thing in common: they leave us wanting more. When you’re a stand-up comic, an after dinner speaker or an acid jazz mime-artist, that’s a fine thing to aim for, but we want a little machine to offer everything from the outset. with a sleek chassis design that sits snugly in the palm of a hand. The common problem is that modern computing is tending ever more towards visual rather than straight computational performance. Graphics componentry takes up a great deal of power and silicon space, while generating more operational heat than a potassium swimsuit, which means you either have a small box with practically zero graphical performance, or a chunkier, louder box with more of a nod towards visual computing. Distilling that further means a compromise between either integrated or discrete graphics. Historically, integrated graphics have been nothing to write home about, but that’s changing. Intel pushed things further by sticking some extra DDR2 silicon into its top-end Haswell parts to create the Iris Pro, and now AMD has released its GCN-powered Kaveri APUs with their beefed-up graphics cores. The Core i5 is our favourite chip for a gaming rig, even when our PC is a small form factor one. Pair it up with a discrete GPU, tap into the overclocking potential of Haswell and watch your system fly. If you’re not looking to overclock, then the cheaper i5-4570 is also an excellent option. However, AMD’s latest APU is the king of integrated graphics. The GCN-powered chip is capable of some decent gaming performance without a discrete graphics card to prop it up. A little tweaking can further help its performance; for example, boosting the GPU can deliver another 10fps in some games.